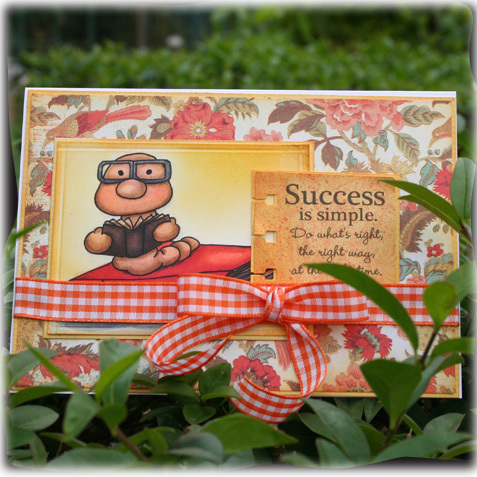 The cute image is from Jens Digi Stamp colored with Copi Ciao and inked. The wonderful sentiment is from Raindrop Echo Design challenge blog: Sentimental Sundays. PP: daisyd's. Punch; Stampin UP. Catch The Bug Challenge - Let’s Get Punchy! I love your card! Such a wonderful creation and the colors are perfect together. Your sentiment is just perfect too! Thank you for playing at CDAC Progressive Challenge this round! Wonderful! Your card is so pretty!!! Wow, wow, wow!!! Gorgeous coloring! Love this Linda!! Your work is so inspirational, I love visiting and soaking in the "lovelies"!! So cute - I love how you've done the image background - it's so effective. Thanks for joining us at One Stitch at a Time this week. Sweet card! Thanks for joining us at Sentimental Sundays. This is such a beautiful card! I just love your coloring and shading! It works beautifully with your gorgeous dp! Take a bow! Thank you for joining us at Freshly Brewed Challenges for our "Use Something New" challenge! Sweet card and adorable image! Love all your layering! Thanks for joining us in this weeks punch challenge at Catch The Bug! What a GORGEOUS card. I love all the detail. Thanks for playing along with us at Catch the Bug for our Get Punchy Challenge! Thank you for joining us at Sentimental Sundays & Good Luck! Your card is so CUTE!! Thanks for joining us at PIO! Have a GREAT day! Super cute card....love the bookworm!!! Thank you for joining us at Sentimental Sundays. What a cutie of a card!!! Love your image and wonderful coloring!!! Thanks for joining us at the Freshly Brewed Something New Challenge. Great treasure I found in your blog. I have just become one of your followers so will be able to see all your beautiful cards when you blog them.